Pete was the co-skipper for most of the two circumnavigations. 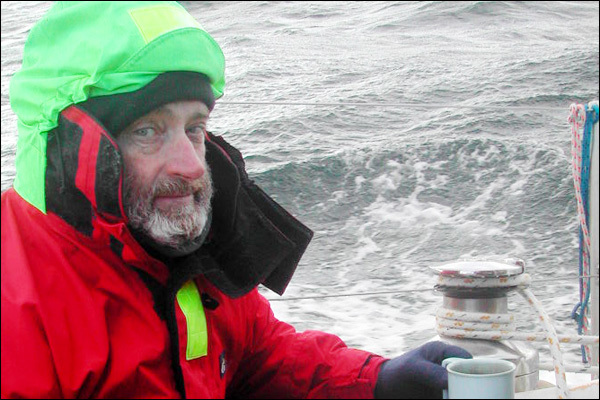 Peter Crozier has been sailing for most of his life. Pete was born and grew up in Australia. He has a degree in pure mathematics and started his career as a teacher. He and a friend bought a 32ft sailing boat soon after he started teaching and this began his love of sailing. Later he went to England with his wife Jeanne, and they bought a small sailing boat which they sailed through the French canals to the Mediterranean and on to Greece where they ran a yacht charter business for the next three years. Finding this less than challenging, they sailed across the Atlantic to the West Indies and then back across the Pacific to Australia. The first of their four children was born three weeks after they arrived back in Australia. Pete became a builder and combined this with sailing for the next 25 years, competing in many offshore races, including several Sydney to HobartSydney-Hobart Race: often described as the most gruelling ocean race in the world, this annual race starts on 26th December from Sydney Harbour and ends in Hobart. The course is 628 nautical miles. and Gosford to Lord Howe Island races.